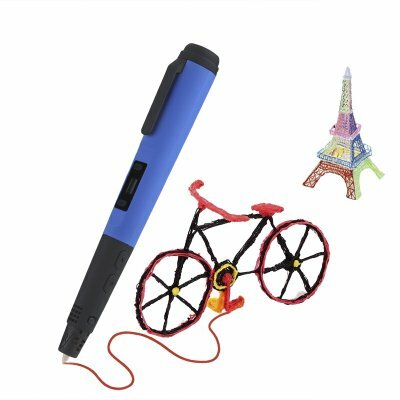 Successfully Added Intelligent 3D Printing Pen - For 3D Drawing + Arts + Crafts Printing, Intelligent Temperature Control, 8 Printing Speeds (Blue) to your Shopping Cart. Let your imagination come to life with this fascinating 3D printing pen. Claiming to be one of the lightest stereoscopic pens in the world this magnificent little electronic gadget lets you create anything you can imagine. Whether you are drawing from freehand or are tracing the pencil tracks of some already exciting design, with this 3D pen the possibilities of your creations are limited only by your imagination. By replacing the ink in a common pen with plastic that gets melted under high temperature, this 3D pen allows you to create real-time 3D objects rather than a simple drawing on paper. Thanks to the patented nozzle design of this extrusion pen the temperature never reaches high levels, ensuring that you can continue your crafts without the need to stop due to over heating. Use it to turn your previous pencil drawings into 3D objects or to create entirely new objects from scratch, with this 3D pen your possibilities are limitless and it even lets you draw into the air. With its sleek and lightweight design this 3D printing pen is extremely portable and can be carried around at any time. Featuring 8 different printing speeds you can be assured that this pen can be used properly for any type of artwork. Along with its well-crafted nozzle this 3D pen is guaranteed to be a perfect fit to any hand, no matter whether it’s used to adults or children. Additionally, this extrusion pen features a super silent design, taking away any annoyance created by noise and letting you enjoy your crafting sessions in peace. Whether you use it for fun, to create art, for designing 3D models of upcoming projects, or to create a unique piece of decoration for in your living room – this 3D printing pen is the perfect little gadget that lets you create anything the mind can imagine. Thanks to its safe design that protects the pen from heating up, this 3D pen is suitable for young and old alike and allows you to explore new dimensions in a creative and fun way. This 3D printer pen comes with a 12 months warranty, brought to you by the leader in electronic devices as well as wholesale electronic gadgets..